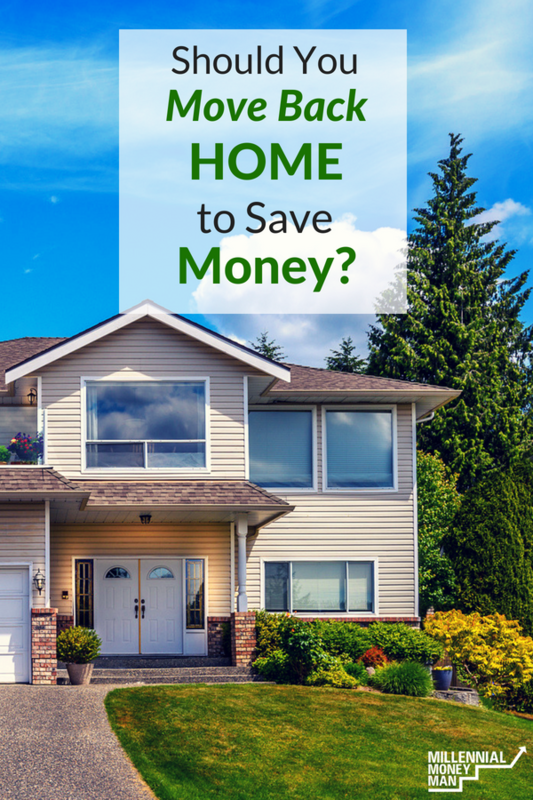 Should You Move Back Home to Save Money? This was actually an interesting reader question that I saw in the M$M Facebook group the other day, and it brought back a lot of memories from when my wife and I rented a room from her parents. Unfortunately, a lot of Millennials are having to consider living with their parents right now because of financial issues (ahem…student loans). According to a study completed by the US Census Bureau, back in 2017, 31% of adults aged 18-34 are living at home. That's crazy, right? Honestly though, the numbers didn't really surprise me. I constantly see readers of this site struggling with that decision. Do you give up your freedom (and along with it your dignity as an adult) by living with your parents in exchange for some breathing room financially? I can't tell you a solid yes or no, but I will share my experience with it. I may be in the minority here, but I actually think it's a good idea to move back home if you're considering it…but not for the reason that you might think. Coral and I lived with her parents after college for a few years. It wasn't something that we really planned on doing previously, but it evolved into that as we got our first jobs (both teachers) and wanted to save some money. At the time, I was facing $40,000 of student loan debt that I really wanted to get rid of. The house was relatively small, so even with just the four of us, it was pretty cramped. The closet didn't have enough room for both of our clothes, so I kept mine on a rack out in the garage. Every morning, I went out to the garage, grabbed something to wear for work, and then threw it in the dryer to get the gasoline smell out (the garage had some lawn equipment in it). There wasn't much privacy, which was probably the worst thing about moving back home. Looking back, I could deal with the closet situation and the 10′ x 10′ bedroom, but now that we have a house…I would have a hard time doing that part again. We actually got married during that time, went on a short honeymoon, and then had to come back to her parents' house. Quite possibly the lamest thing ever, and it was super embarrassing (as you could probably imagine). Not exactly the ideal way to start your married life together, right? But with the amount of money I was able to pay towards my debt, it was worth it. Coral also was able to pay for our wedding and saved up a good amount of money afterward as well, which put us in a position that allowed me to eventually leave band directing and pursue this website full-time. Unfortunately, money wasn't the only reason we lived there. While Coral and I were both in college, her father Bill was diagnosed with a disease called Inclusion Body Myositis. Basically, it's a disease that causes your muscles to get weaker over time (similar to muscular dystrophy). When we first moved in, Bill was still able to walk and had a lot of independence. He was still healthy. But throughout the time that we lived with them, he got progressively weaker and eventually needed a wheelchair full-time. We helped care for him while we lived there, mainly because he was a big dude and he started falling a lot due to his disease. It was basically impossible for my mother-in-law to get him back up on her own, so instead of living somewhere else and having to drive over several times a week to help out with things, we decided to stay put as long as we could. It was just easier that way and probably less stressful for everyone. There would be times where I'd hear the *thud* at 3:00 am and know exactly what it was. Coral's mom and I would immediately start the process of getting him back on the bed, which usually took about 30 minutes or so. It was a bad situation obviously, but Bill was really funny and always had some good jokes to lighten things up. I actually have some really good memories of all of us just laughing because Bill would put himself in these ridiculous situations by trying to do something that he probably shouldn't have. It's hard to explain how something like a person falling could be funny, but it was one of those “laugh so that you don't cry” things I guess. One time, he literally launched himself in the air from his wheelchair (into a pile of rocks outside the front door no less) because he wanted to go down his wheelchair ramp really fast for some reason. Bill was an adrenaline junkie all his life, so he damn-sure wasn't going to let a wheelchair stand in his way. Even with all of the cramped spaces and Bill's disease, we still managed to have a lot of fun with Coral's parents while we were there. We'd cook breakfast for them on the weekends and actually go to movies and do fun stuff together every once in a while. It certainly could have been worse. But…eventually living with them started to wear on us. As the hospice nurses started to come in and out later into Bill's disease, it just got to the point where we had zero privacy and was causing some strain on our marriage. That was basically our limit – when it started to have an effect on our relationship, we needed to leave. So, we moved out. A few months later, we were in Jamaica on vacation when her mom called and told us that Coral's dad had passed away. One of the first things we both thought after we reflected on it a little bit is that we were glad that we lived there with them. It was hard, and yes it sucked, and yes it was embarrassing, but after he passed away…none of that stuff mattered. We were just happy we had the extra time with him while we had the chance. So with all of that said, should you move back in with your parents to meet a financial goal if you have the opportunity? To me, it all comes down to how well you and your parents think you'll get along. Some people just straight-up don't get along with their parents. Some readers that I've talked to love hanging out with their parents. It really just depends on how strong your existing relationship is. I feel like Coral and I were really lucky in that regard. Aside from the obvious difficulties that I mentioned above, her parents were actually really cool to live with. We're close with her mom still and have her over to dinner at the house every week. As far as I can tell, it didn't hurt our relationship with them (probably the opposite actually). For me, most decisions like these are about perspective. There are people in this world that don't know where their next meal is coming from. Is moving back in with your parents to save money really that bad in the grand scheme? Is it that big of a sacrifice to get ahead financially? I feel like this always gets lost in the conversation about Millennials moving back home. We all tend to focus on the young person and how it might make their life more/less difficult. But the reality is that the parents are making the bigger sacrifice just by allowing someone to come back into their home. If you're planning on moving back in with them, keep that in mind when you feel like they're being too intrusive on your life or too annoying. You're interrupting their life, not the other way around. Take the trash out. Do the dishes. Cook breakfast. There obviously needs to be some type of agreement about rent/no rent, but it shouldn't just stop there. You need to do the extra things when possible. It's just the right thing to do. Don't be a stereotype. If your parents have agreed to let you move in to save money…you need to save money. If it's to pay down debt, you need to do that aggressively. Communicate about what your financial goals are, and then make sure that they know your progress along the way. There will be times that you find yourself getting antsy or bickering a lot with the people you are living with. When that starts to happen, take a break. Go on a weekend vacation, or if nothing else…just get out of the house for a while. It keeps everyone sane. Moving back home is a touchy subject. People around you will make little comments about you needing to live on your own, needing to grow up, etc. None of that really matters. If you have an agreement with your parents and clear financial goals, just do you and don't worry about what other people say. Could you move back in with your parents to save money? Or…would it drive you crazy? Totally agree with this list – setting expectations is the big thing I think that needs to be done. If there are clear expectations I think that sets everyone up to have things go well. I could move back in to save money if I had to but I don’t want to move to Florida, haha. But like, I’d have no problem living with my parents at this point in my life. In fact, we’ve already talked with my mom about having her move in with us if my dad were to die in the next few years. We both get along GREAT with both my mom and my dad, and I get along with my MIL too. We’re not in a position where we’d have to do it, but if we did for whatever reason, I’d have no worries about doing it. Yeah I’m kinda in the same place. If my MIL or mom needed to move in with us, that would be fine. I feel like I’m getting more open to that kind of stuff as I get older. I want to spend time with people while I can. I moved back home for several months after I graduate college. It wasn’t an ideal thing since I’ve never had a close relationship with either of my parents. There were a lot of negatives, some of which I wrote about in an article for The Financial Diet, but one positive was the money situation. I was able to put a good chunk towards my student loans. I ended up moving out before I finished paying off my student loans, but the experience did help in kickstarting my debt payoff journey. Yeah I could see it being tough if you weren’t close before. We feel like we just lucked out in that regard. I *have* moved back in with my mom, at age 27 (I’m almost 28)– and while it can sometimes be tough on both of us, I in no way regret it. Because I did it, I will be free of all but one student loan next year (including a paid off, solid, working car), and I will be able to save up a down payment for my own decent townhouse or condo, which is a huge thing for me. I should be debt-free and building sweet equity by the time I’m 30. Moving back home has also allowed me to focus pretty hard on changing careers (into IT), which is allowing me to ramp up my income relatively quickly. That is also huge for my financial plans, and has taken so much stress off of me. All in all, in spite of us driving each other crazy sometimes (we really do love each other and get along well overall), I’m really glad I made the choice. I’ve gotten very little negative feedback from people on doing it, and when it does happen, I just remind myself that I’m on track to be debt free and have a positive net worth by 30. That’s a great perspective! I’m glad you don’t get a bunch of negative feedback. We did sometimes, which I always thought was weird because it was really obvious to people who knew what was going on why we stayed as long as we did. People are weird with their life expectations for other people haha. I lived with my parents for two years after college even though I landed a job at the best company in my field. I had no student debt but wanted to build my savings and start my adult life in a strong financial position. It was certainly a bit of a sacrifice of freedom but I ‘m really glad I did so. I built up a very nice safety net and have been on a great financial path ever since. Saving money on housing has been a bit of a theme in my life after moving out as well. By living somewhere well below my means, I’ve had the means to do just about everything else I wanted while still saving a healthy amount. That’s awesome! I’m glad it worked out for you, and I’m the same. I’m glad we did it. I moved back in with my dad last year. It wasn’t the plan but it’s worked out for the best. I’m able to put more money toward my last loan and it’s benefitted him too since he quit his job last year to pursue starting his own business. We get along really well so I don’t mind it at all. It’s not the first time I’ve moved back in with him (I moved in temporarily after undergrad and then again after grad school while I was job hunting) but this may be the last time I live with him so I’m enjoying our time together! I left home at 18 due to strong philosophical differences with my parents. Though I attended a local college, I rented my own place out in the country rather than live at home. Although I lived frugally ($15,000/year), this decision cost me a total of $60,000 in the four years I lived there prior to getting married. That’s a serious chunk of change, particularly once growth through compound interest is factored in. Still, in hindsight I feel the decision was worth it. Only those who know me personally will understand how difficult things must have been when living at home for me to say that about $60,000! My recommendation to my sister-in-law, now in college, is for her to stay at home as long as she can due to the monetary advantage. Yeah it’s just not a good fit for some people; nothing wrong with that! I always told high school kids that they needed to stay home, and they usually didn’t take my advice haha. Hopefully your sister does! It’s great that you got to spend that last year with your father in law and help him in his time of need. I lived at home until I was 24. My husband and I lived between our three houses for three years before that. We saved up $55k in the space of two years once we got FT jobs and bought our first home. We’ve been there now for 7 years this June. Crazy how time flies. I can’t imagine ever moving back and hopefully we will own out place by the time I am 40 and won’t have to, but it can get a great way to kick start your savings and get on top of debt to give you a clean slate when you are ready to move out again. Also is a great motivator to stick to your goal of saving so you can get your privacy back. I am very grateful to our our parents who let us live at home at the time so we had the ability to save for our own house. With house prices these days and the cost of education Millennials can really use the help. Yeah I was grateful too. I mean obviously we helped a lot, but it gave us such a huge head start. Pretty crazy to think about now that we are a few years removed from it. This is such a good article and you make some great points that most people don’t ever think about. I hate that you and Coral had to go through that, but at least you were able to be around and help out during that time. Hanna and I have never moved back officially, but when we made the transition to trailer life there was a 3 – 4 month period where we lived back at home. That was about my limit though. These definitely get overlooked way too often when folks make this move, and I’m so glad you made a point to bring them out. Thanks Nick! These are my favorite ones to write. I’d rather write about real life stuff than “10 ways to *insert whatever*. I love my parents, but I think 3-4 months would probably be my limit too haha. We were just lucky to really get along with Coral’s parents. I know I’m kind of late to comment on here, but I just read this article. I agree, if you can get along with your family and things are good, why not? Family is important to a lot of people and it’s great to have support. My issue is I’m 26 and going through health problems, so I’m close to moving back home. I live 5 hours away and work in an amazing job with the best people I’ve ever met and leaving them behind is going to be so hard for me. I’m trying to weigh the pros and cons of living alone on my own with this illness to keep my great job, or to move back home and work full time but have some people who can watch over me and make me feel secure again. It’s a tough spot to be in and either way, there are both pros and cons. Right now, I’m writing down to see what’s truly important to me and if my needs are being met living here, or if they would be there. I will save so much money not having to pay rent, but the job I’m currently pursing back home is an hour away from where I live and that’s a pretty far commute! I guess that’s my 2 cents. Omg I’m so glad I read this blog..I want to buy my first home and want to be able to save for it. I was going back with the decision of moving back home with my parents..my mom and dad is all for it.but I dont want to be there for ever I have goals..Thank you so much!